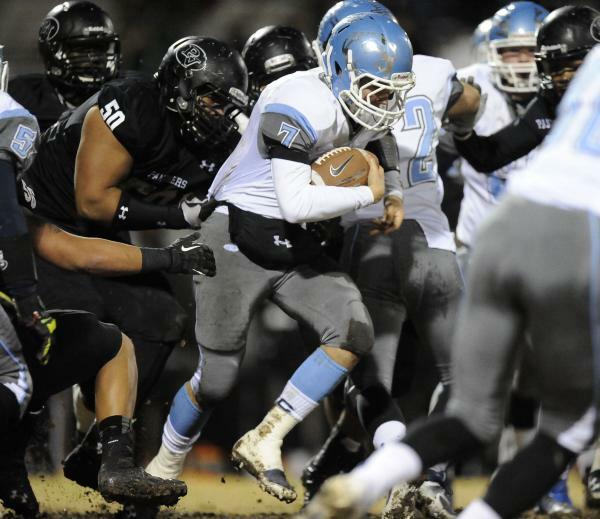 Palo Verde's Calvin Beaulieu (22) runs away from the Centennial defense. Centennial's Dieyon Scott (28) wraps up Palo Verde's Jaren Campbell. 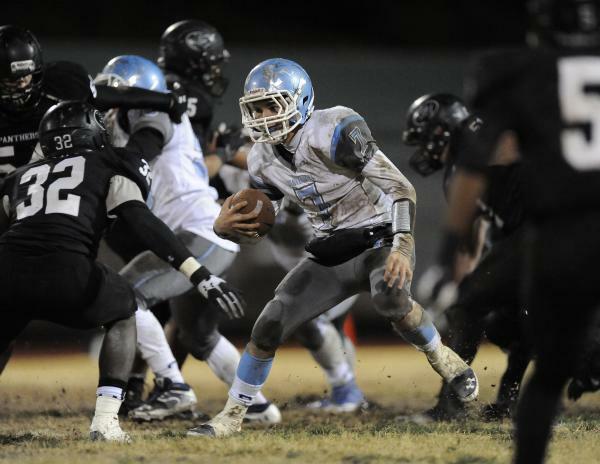 Palo Verde's Calvin Beaulieu looks for running room against Centennial's defense. 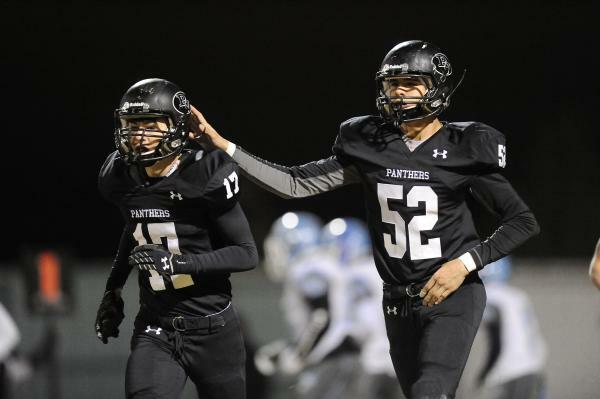 Palo Verde's Ean Whitehouse (52) congratulates kicker Bradley Matsukawa. 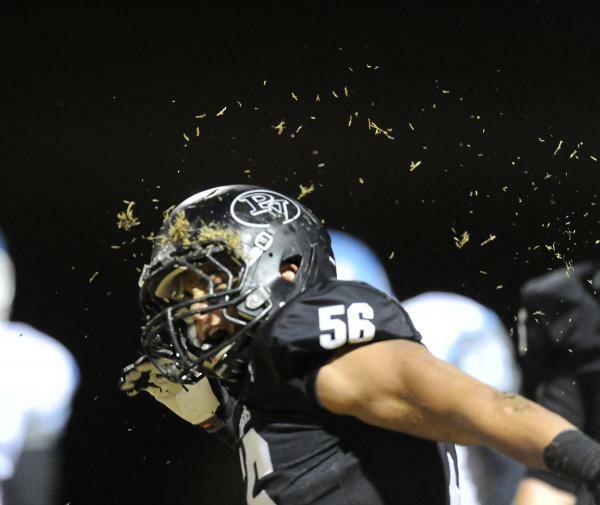 Palo Verde's Josh Hamilton celebrates after a sack. 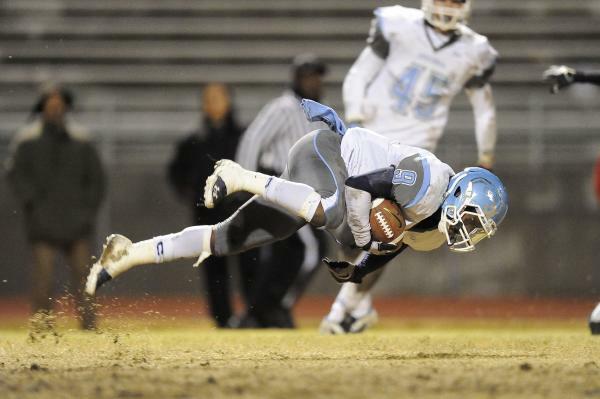 Centennial's Gene Haley loses his balance while returning a kick. 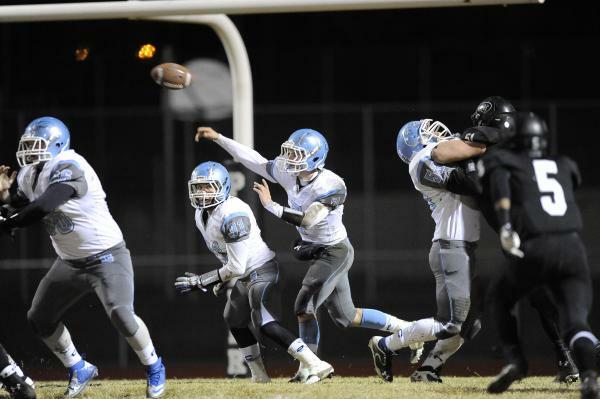 Palo Verde quarterback Parker Rost (6) tosses the ball to Hykeem Massey. 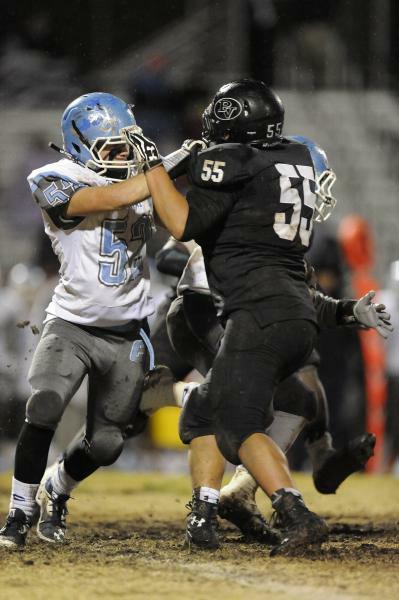 Palo Verde's Nick Ortega (55) confronts Centennial's Anthony Parnell. 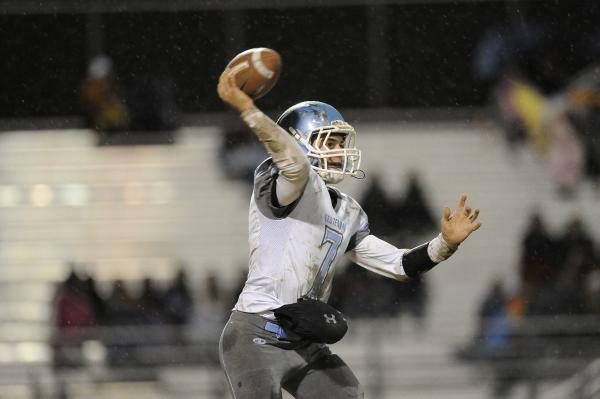 Centennial's Coll Thomson throws a pass. 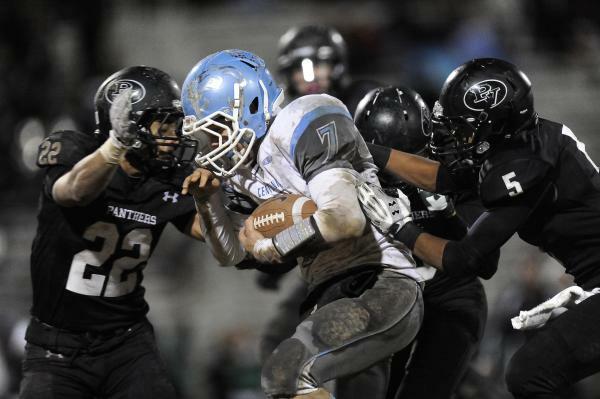 Centennial's Coll Thomson (7) looks for room against Palo Verde's Chauntez Thomas (32). 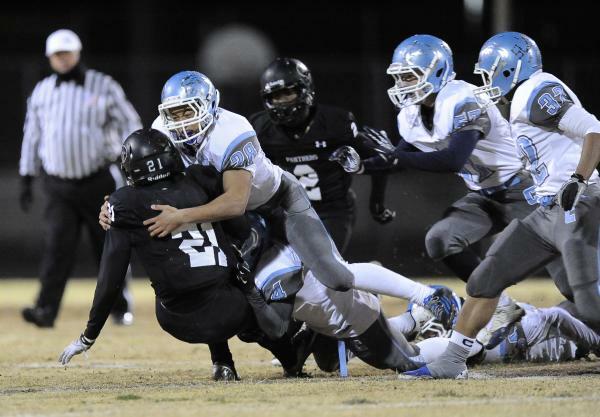 Centennial's Coll Thomson (7) is surrounded by Palo Verde's Calvin Beaulieu (22) and Christopher Johnson (5). 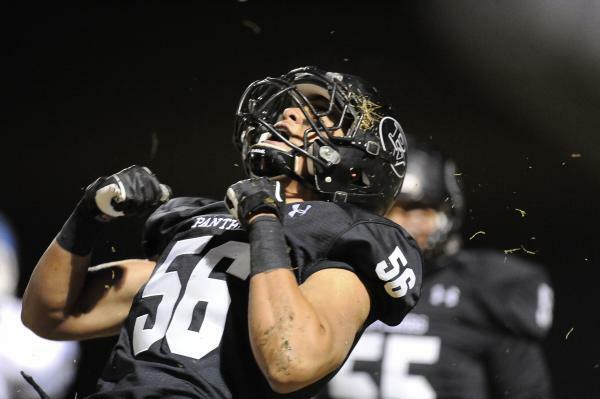 Palo Verde's Josh Hamilton flies through the air to hit Centennial's Coll Thomson. Palo Verde’s Calvin Beaulieu was one broken tackle from returning the opening kickoff 99 yards for a touchdown Friday. Twelve plays later, the Panthers were off to the races anyway. Palo Verde used a dominant running game to build momentum early and never let go en route to a 42-14 win over visiting Centennial in a Sunset Region semifinal. The Panthers (10-1) will visit Bishop Gorman (11-2) at 1 p.m. on Nov. 30 for the Sunset title and a berth in the Division I state final. Beaulieu raced upfield with the opening kickoff but ran squarely into Centennial kicker Zach Mays at the 43-yard line. Mays was the last obstacle between Beaulieu and the end zone. Still, the Panthers drove 57 yards in 12 plays to take the lead on Jaren Campbell’s 1-yard run with 7 minutes, 1 second left in the first quarter. After Palo Verde’s defense forced a three-and-out, Beaulieu capped a five-play, 44-yard drive with a 3-yard run to give the Panthers a 14-0 lead. Hykeem Massey tacked on a 35-yard touchdown run during the second quarter, and Massey and Parker Rost each ran for a score during a 90-second span of the third quarter as the Panthers built a 35-0 lead. Palo Verde ran the ball on 50 of its 52 offensive plays, including each of its first 33, racking up 315 yards on the ground. Beaulieu finished with 92 yards on 15 carries. Parker Rost added 89 yards on eight carries, and Massey totaled 87 yards on seven carries. 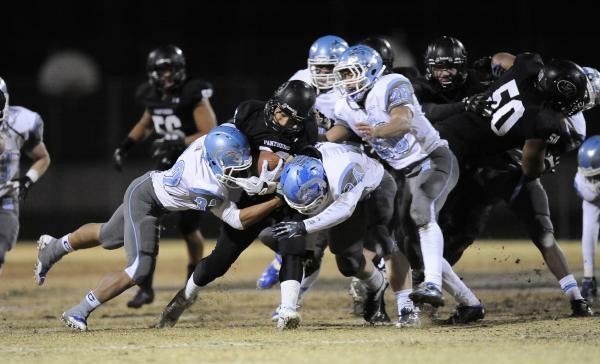 Centennial (6-5), meanwhile, couldn’t get out of its own way. The Bulldogs’ first first down came with 6:52 left in the second quarter. And after Massey’s second touchdown, Palo Verde’s kickoff hit the leg of one of Centennial’s up men and ricocheted right to a Palo Verde player. Lantz Worthington finally got Centennial untracked with a 99-yard touchdown run to begin the fourth quarter, but Palo Verde needed only two plays after the onside kick for Parker Rost to race 56 yards with another score. 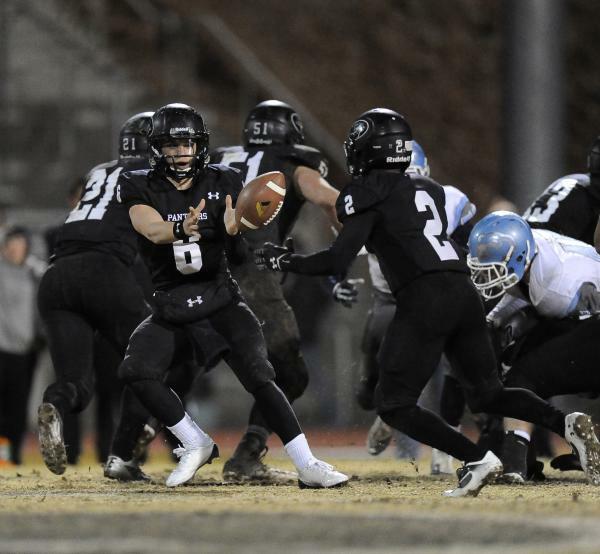 Until Worthington’s run, the Bulldogs had compiled only 47 yards of total offense. Worthington finished with 134 yards on 11 carries. Coll Thomson added a 1-yard TD run in the final minute for Centennial.